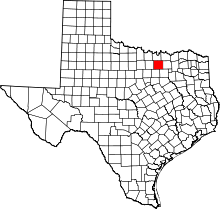 Celina (/sᵻˈlaɪnə/ sə-LY-nə) is a city in Collin and Denton counties, Texas, United States. As of the 2010 census, Celina had a population of 6,028, up from 1,861 at the 2000 census. Celina is located at 33°19′11″N 96°46′58″W﻿ / ﻿33.319846°N 96.782799°W﻿ / 33.319846; -96.782799. Being mostly farm and ranch land, the terrain is largely open fields on flat-to-gently-rolling terrain. The ambient air temperature is typically 4 to 6 °F cooler than Dallas 30 miles (48 km) south. The Celina High School football team is one of the most successful programs in Texas, with a UIL-record eight state titles and a 68-game winning streak. The Bobcats were the subject of the documentary The Power, Passion and Glory. Celina won state football championships in 1974 (co-championship with Big Sandy High School, one of the all-time dominant teams), 1995, 1998–2001, 2005, and 2007. The Celina High School baseball team has been successful as well, making the playoffs many times and winning the state championship in 2002. In 2010, Kenny Chesney wrote a song called "The Boys of Fall". Part of the music video, having to do with high school football, shot scenes of Celina. Sports announcer and 2012 U.S. Senate candidate Craig James resides in Celina. 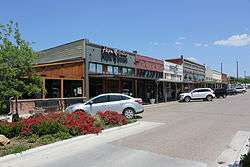 Celina is undergoing rapid growth. Having never before had any kind of retail chain other than two fuel stations and a small Chevrolet dealership, Celina saw a Sonic restaurant completed in 2003. In October 2005, Brookshire's broke ground for construction of a new grocery store, where for 18 months prior only a sign had stood announcing the "future home" in the cow pasture at the corner of Preston Road and County Road 91. A McDonald's restaurant opened in October 2011. Since 1999, much of the country land has tripled in price. Celina is served by the Celina Independent School District and home to the Celina High School Bobcats. Celina has 1 elementary school, Celina Elementary School serving children in pre-K through grade 2; 1 intermediate school, Celina Intermediate School serving children in grades 3 & 4; one middle school Celina Middle School for grades 5 & 6; one junior high Celina Junior High School covering grades 7 & 8; and a high school Celina High School. As of the census of 2000, there were 1,861 people, 644 households, and 484 families residing in the town. The population density was 1,104.0 people per square mile (425.2/km2). There were 703 housing units at an average density of 417.0/sq mi (160.6/km2). The racial makeup of the town was 77.38% White, 9.19% African American, 0.27% Native American, 0.11% Asian, 11.34% from other races, and 1.72% from two or more races. Hispanic or Latino of any race were 22.73% of the population. There were 644 households out of which 39.9% had children under the age of 18 living with them, 53.6% were married couples living together, 14.8% had a female householder with no husband present, and 24.8% were non-families. 21.7% of all households were made up of individuals and 9.9% had someone living alone who was 65 years of age or older. The average household size was 2.84 and the average family size was 3.28. In the town the population was spread out with 30.0% under the age of 18, 9.0% from 18 to 24, 30.0% from 25 to 44, 18.2% from 45 to 64, and 12.7% who were 65 years of age or older. The median age was 33 years. For every 100 females there were 101.0 males. For every 100 females age 18 and over, there were 94.9 males. The median income for a household in the town was $37,383, and the median income for a family was $41,131. Males had a median income of $32,000 versus $29,135 for females. The per capita income for the town was $17,499. About 10.7% of families and 13.4% of the population were below the poverty line, including 19.3% of those under age 18 and 4.9% of those age 65 or over. The climate in this area is characterized by hot, humid summers and generally mild to cool winters. According to the Köppen Climate Classification system, Celina has a humid subtropical climate, abbreviated "Cfa" on climate maps. ↑ US Census change list Archived August 6, 2010, at the Wayback Machine. ↑ "Profile of General Population and Housing Characteristics: 2010 Demographic Profile Data (DP-1): Celina city, Texas". U.S. Census Bureau, American Factfinder. Archived from the original on September 11, 2013. Retrieved June 29, 2012. ↑ "Geographic Identifiers: 2010 Demographic Profile Data (G001): Celina city, Texas". U.S. Census Bureau, American Factfinder. Archived from the original on September 11, 2013. Retrieved June 29, 2012.